Lighter scanning cameras are not strange to many of our customers. They work for the poker analyzer as a scanner to scan the barcode marked cards. Also it’s a lighter that we can use it to fire. It’s easily used and very popular. Now we upgrade the lighter camera to be an advanced version, the transparent lighter scanning camera without magnet. Compare with the traditional lighter cameras, the advanced scanning camera of lighter has the following features. 1st, the lighters are the original ones, with the same size, the same shape, the completely same transparent appearance. People can even see the gas directly. Since others can’t see any differences on the lighter, people won’t take any doubt in the lighter, which makes it much safer to use. 2nd, the advanced version lighter has the unique on or off switch without magnet and inverted design of frequency change, which makes it much easier, more convenient to use. And also, it can save the energy that makes the battery to work for longer time. 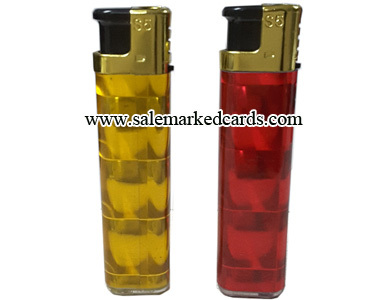 3rd, the advanced version lighter are produced at the unique model with different colors such as red, blue, green, yellow and so on. You can always choose the one you like. 4th, the advanced version lighter has a super wide distance of 20-50cm, which is 10cm wider than other cameras.